Teaching your dog to sit on command can help you keep them under control in almost any situation. A dog sitting down can’t misbehave, and in a situation where they’re unsure or anxious, the “sit” command will calm them down. Teaching “sit” isn’t too hard, either. 1. You’ll need some small treats that your dog really enjoys – and something that they can eat quickly so you don’t have to stop the training session to wait for your dog to finish chewing! If you’re training a puppy, then make sure they’re soft enough for young teeth - like PEDIGREE® Training Treats Soft. The smaller your puppy, the smaller the treats should be. 2. Take a treat between your thumb and index finger and fold the rest of your fingers against your palm. Put the treat close to your dog's nose, no more than a centimetre away. You should now have their attention. Once your dog is concentrating on you (and the treat), move onto the next step. 3. Slowly lift the treat up over your dog’s head, and hold it there. As your dog lifts their head to nibble at the treat, their bottom will go down. 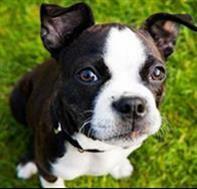 Say "Sit" as soon as you see your dog’s bottom start to move towards the ground. (This will help him learn to a sitting movement with the word. Later, once he understands, you can say it beforehand.) Praise your dog warmly and give them the treat. If it’s not working straight away, here are some more tips that can help you train your dog to sit. If your dog moves backwards instead of sitting: try the exercise next to a wall or in a corner so they can't easily move backwards. Or you can gently use your free hand to guide your dog into a sitting position, then praise them while giving him the treat. After a few goes, they should catch on. If your dog’s too excited: try doing a session immediately after a meal or when they’re more relaxed. Or use less tasty food! You’ll need to repeat the session in lots of different places around your home and outside, too.